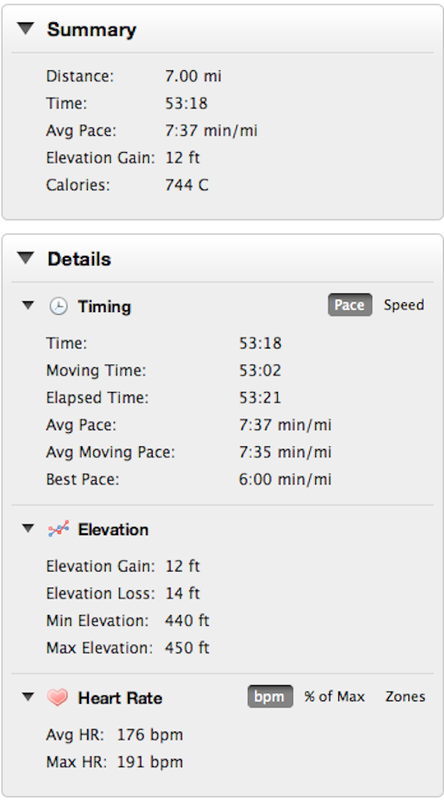 Workout: 7 miles @ 7:37 pace. Weather: 77 degrees, partly cloudy. Warm out there today at 77 degrees and 83% humidity. Awful conditions, and I felt them after mile 3. The first two miles were pretty comfortable. I thought I’d have another easy run. Then it got hard. I wanted to quit the whole time. Rather than try to silence the voice in my head that said, “Quit”, I embraced. Like being a pitcher at an unfriendly ball park, I just pictured the fans booing me the whole time and still doing my job. Only instead of fans, it was just me telling myself to give up and try again another day. I didn’t run for the last two days – partly to let the foot rest, and partially because I just didn’t get out there in time. Every time I kept trying to declare the Texas summer over, it keeps coming back. I’m done this time. It can end when it wants to… hopefully soon. Off to watch Texas-Oklahoma. Hookem Horns! Workout: 3 miles @ 6:10 pace; core work. Weather: 77 degrees, sunny. Recap: That was tough. Probably the warmest weather run I’ve done all year, and it just happened to be on my first day at this pace after a time trial. 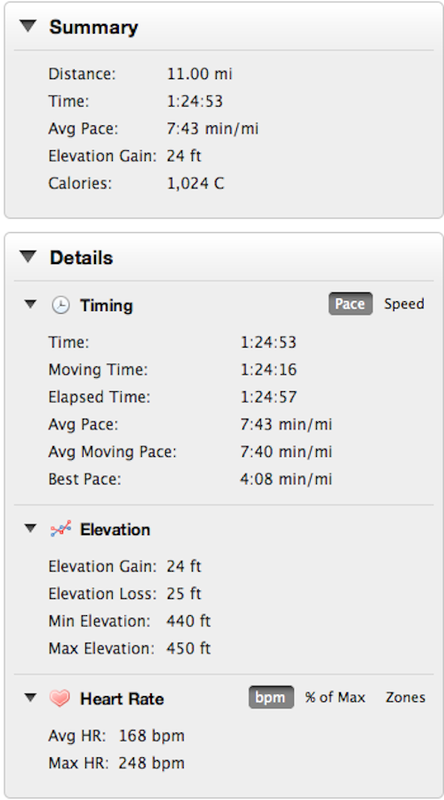 Heart rate wise it was harder than yesterday, even though I was slower. 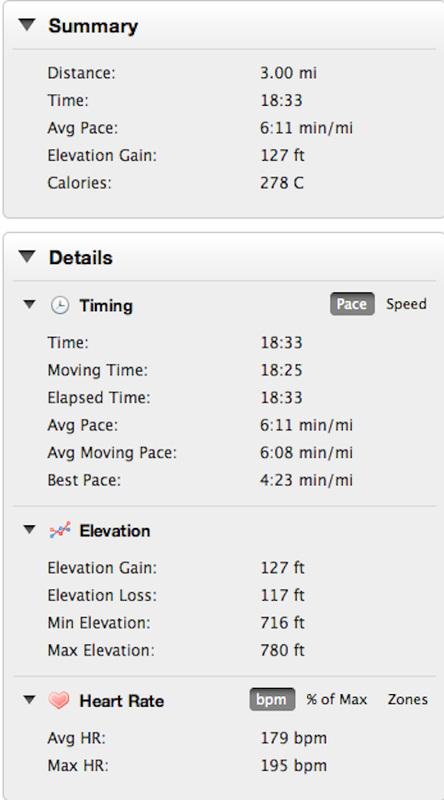 Never a good sign when you are asking yourself, “Can I keep this up every day?” in the middle of the run. That said, glad to have finished. Want big boy results – have to do big boy runs. Core work back to full again. Just focused on getting through 7 cycles (10 pushups, supermans, squats, situps, and 10 sec plank). Going to hunker down on nutrition this month (for real). Gotta eat well to survive this. This month means a lot to me. I’ve made two previous attempts in the last year to make plans to reach my 5K personal best (17:42). I set it back in high school and came close to breaking it 2011 (17:44). For whatever reason lately, I haven’t really come close. Really motivated to smash through the PR and move on to bigger and better things. Hopefully everything comes together on July 20.